This is a simple Greek meze, usually accompanied by the Greek drink ouzo. A meze is a kind of hors d'œuvre eaten in Greece, accompanied by ouzo, retsina or beer. 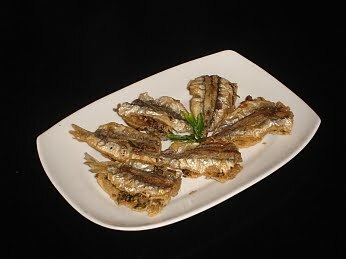 The fish gavros (whiting) is very popular in Greece. This meze can also be a side dish at a meal or as part of a buffet. 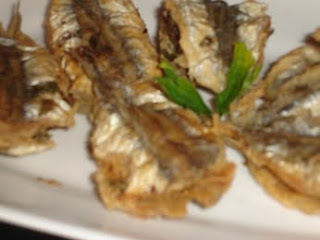 Remove and discard the head, entrails and spine of the whiting. When you remove the spine, fold open the fillet but making sure that it is joined the in the middle after removing the spine. Drain the fillets and salt them. Make ‘sandwiches’ with the fillets – placing one on top of another, with the inside part in the middle. Place a layer of parsley and garlic in the middle of each of the fillet ‘sandwiches’ and then carefully sprinkle flour on the outside. Put the oil in a pan and heat until it is very hot. Carefully place the fillets in the oil and fry each side for about 3–4 minutes. The combination of the oil and the flour will ensure that both sides of the fillet will stick to each other. I've never tried this but it looks delicious and with ouzo? even better.